The Trump administration has called for a cease-fire in Yemen, where years of violence have left thousands dead and millions more facing full-blown famine. Both Secretary of State Mike Pompeo and Secretary of Defense Jim Mattis asked combatants to come to the negotiating table for peace talks within a month. In a carefully worded statement Tuesday, Pompeo called on Houthi rebels to stop firing missiles into the territories of neighboring Arab countries. The Shiite militia, backed by Iran, has launched several such missiles at Saudi Arabia and other members of the Sunni coalition that intervened in Yemen in 2015. The statement appears to place the onus on the Houthis to halt their attacks first, before the Saudi-led coalition — which receives U.S. assistance — stops some of its military operations in turn. Nevertheless, Pompeo’s call for a cease-fire marks one of the Trump administration’s strongest pushes for peace in Yemen yet. And his support for “substantive consultations” under the United Nations was embraced by the diplomat leading them. U.N. Special Envoy Martin Griffiths urged all parties “to seize this opportunity to engage constructively” with the bid to resume peace talks and ease the most immediate of the woes currently confronting Yemeni civilians. Balancing the positive rhetoric is the dire situation unfolding on the ground. Since 2014, when the Houthis captured much of the country’s northwest, including the capital, Sanaa, more than 17,000 civilians have been killed or wounded, and the country’s health infrastructure has been so badly ravaged, more than 1 million people have contracted otherwise preventable diseases. Now, the U.N.’s humanitarian chief is warning that as many as 14 million — or roughly half the Yemeni population — could soon be entirely reliant on foreign aid to survive. Mark Lowcock told the U.N. Security Council that Yemen is teetering dangerously close to enduring just the third famine the world has known in the past two decades. The “clear and present danger” confronting Yemenis is “much bigger than anything any professional in this field has seen during their working lives,” Lowcock added. Despite concerns raised by international aid groups and some lawmakers, the White House has steadfastly backed its friend in the fray, Saudi Arabia, defending the Saudi coalition’s efforts to prevent civilian casualties. Defense Secretary Mattis reiterated that defense at a forum held Tuesday at the U.S. Institute of Peace in Washington, D.C. But he also floated a proposed deadline for a cease-fire. As NPR’s Michele Kelemen notes, Sweden’s foreign minister has offered to host the meeting. 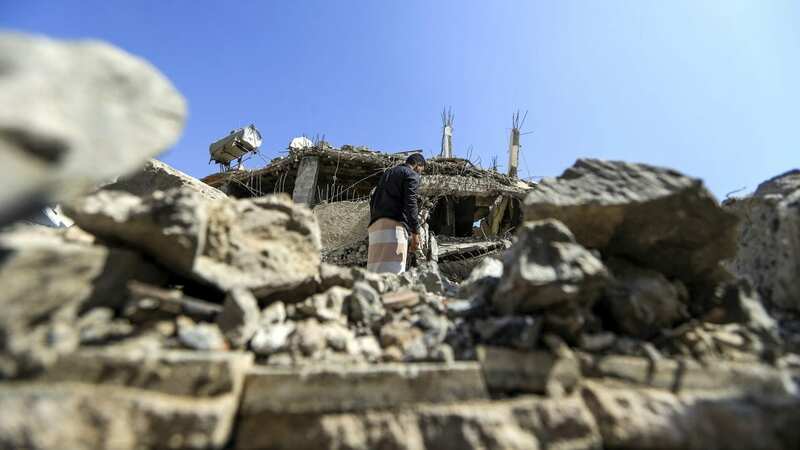 Last month, Griffiths attempted a similar bid to bring the parties to the negotiating table in Geneva, but the effort collapsed after the Houthis refused to attend. In Pompeo’s statement, released Tuesday night not long after Mattis made his comments, the secretary of state declared that these talks must be revived next month. “It is time to end this conflict, replace conflict with compromise, and allow the Yemeni people to heal through peace and reconstruction,” he said.